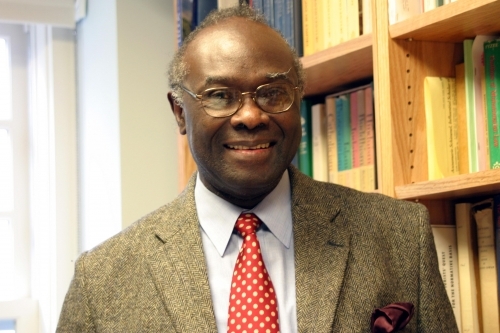 It is with great saddness that we announce the sudden death of Lamin Sanneh, D. Willis James Professor of Missions and World Christianity at Yale Divinity School. Many colleagues were with Lamin just before the Christmas break when he was anticipating the arrival of his family and the celebration of Christmas. An announcement like this seemed unimaginable; however, Lamin suffered a stroke and passed away on Sunday, January 6, 2019, surrounded by his family. Lamin was the author or editor or co-editor of twenty books and monograph-length essays and well over 200 articles and chapters in scholarly venues. Some of the most notable books include Translating the Message: The Missionary Impact on Culture (Orbis, 1989; 13th printing 2002; 2nd ed., 2009), Abolitionists Abroad: American Blacks and the Making of Modern West Africa (Harvard University Press, 2000; selected for review in The New York Review of Books), Whose Religion is Christianity? The Gospel Beyond the West (Eerdmans, 2003; trans. into German, 2013), Disciples of All Nations: Pillars of World Christianity (Oxford, 2008), Beyond Jihad: Pacifist Impetus in Muslim West Africa and Beyond (Oxford, 2016), and The Wiley-Blackwell Companion to World Christianity, co-edited with Michael McClymond (Wiley, 2016). His work was widely recognized for its quality. He was made Commandeur de l’Ordre National du Lion, Senegal’s highest honor, in 2002 and received the Marianist Award from the University of Dayton in 2011. Lamin’s story is remarkable by any standard of measurement. It is best understood in his own words in Summoned from the Margin: Homecoming of an African (Eerdmans, 2012). Our prayers and thoughts go out to Sandra Sanneh, the children, and the grandchildren, who will miss their husband, father, and grandfather.